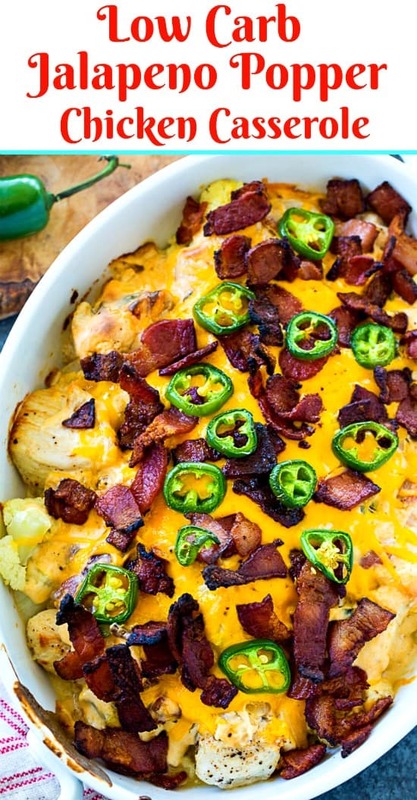 Low Carb Jalapeno Popper Chicken Casserole has chunks of white meat chicken covered in a creamy, cheesy sauce with tons of bacon. This meal is so fabulously rich and will leave you feeling ultra satisfied. 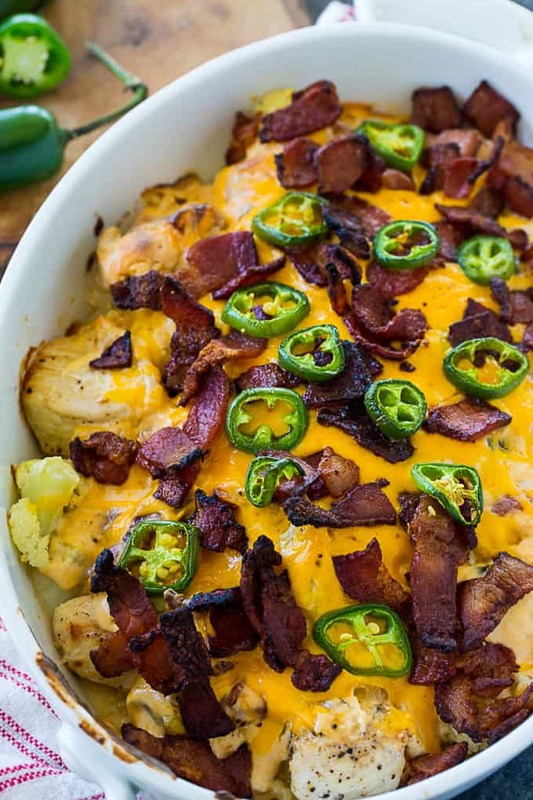 This casserole is keto-friendly and gluten-free and perfectly easy to make. 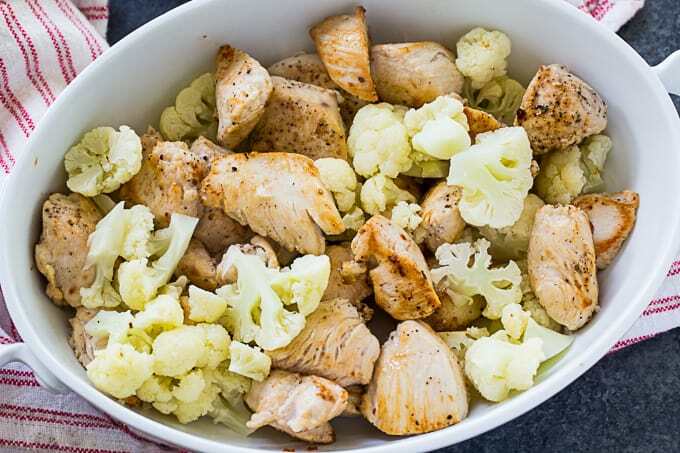 In addition to chunks of chicken this casserole also has cauliflower florets. 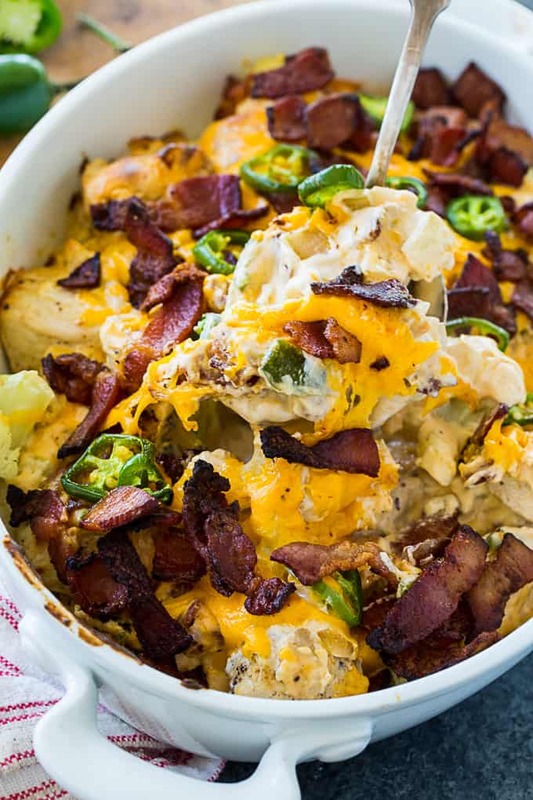 Everyone knows how good cauliflower tastes with cheese and bacon. The cauliflower adds some fiber to the casserole. Set the bacon aside and drain off all but 1 tablespoon of bacon grease. Season the chicken with salt and pepper and cook it in the bacon grease until browned on all sides. Place the chicken in a 2-quart baking dish. Add the steamed cauliflower. Cook the onion and diced jalapeno in the same pan you cooked the chicken until they get soft. Cut the cream cheese in chunks and add them to the pan along with the heavy cream. Stir until the cream cheese is completely melted. Stir in 1 cup of cheddar cheese and half the bacon. Pour sauce over the chicken. Sprinkle the remaining cheedar and bacon on top. Scatter the sliced jalapeno on top. Bake at 375 for 20 minutes and enjoy! This is a really heavy and filling casserole. Best to serve it with a simple green salad or some steamed broccoli. This recipe can easily be doubled and cooked in a 9×13-inch pan. Leftovers reheat well. 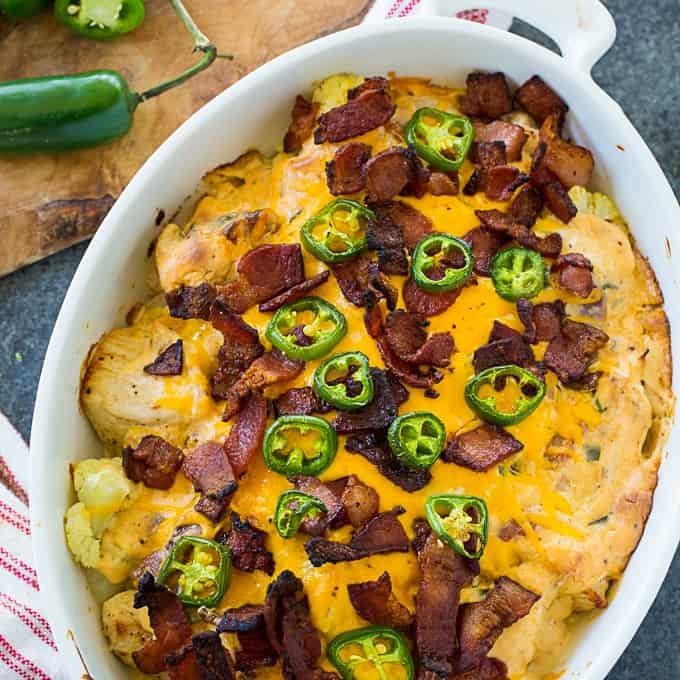 Give Low Carb Jalapeno Popper Chicken Casserole a try and I think it will become one of your favorite low carb casseroles. Cook bacon in a large nonstick pan until crispy. Remove with a slotted spoon and set aside. Drain off all but 1 tablespoon of bacon grease. Season chicken with salt and pepper and cook in the bacon grese until browned. Remove chicken from skillet and place in a lightly greased casserole dish. Add cauliflower. Note: Chicken can be a little undercooked at this point. It will finish cooking in the oven. If necessary, add a little more bacon grease to the skillet. Cook onion and diced jalapeno for 3 minutes. Add garlic and cook 1 more minute. Cut cream cheese into chunks and add to skillet. Add heavy cream. Stir until cream cheese is completely melted. Stir in 1 cup of shredded cheddar. Add half of bacon to the cream cheese mixture and pour over chicken. 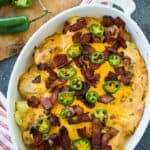 Sprinkle remaining cheddar and bacon on top along with the sliced jalapeno.